It has been a long time since my last post. Here is what’s new. Had major success canning tomatoes last Fall. The pickling turned out real well too. Started my onions indoors last week. Received a $5000 grant from Lowe’s to build a garden at the school where I teach. 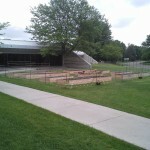 Attended a school garden conference at the U of MN Arboretum. Look for more detailed updates as the planting season approaches here in MN. 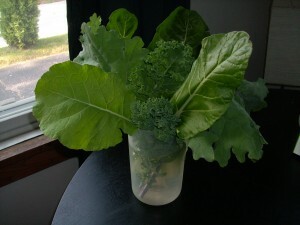 Here is a bouquet of cooking greens from my garden. 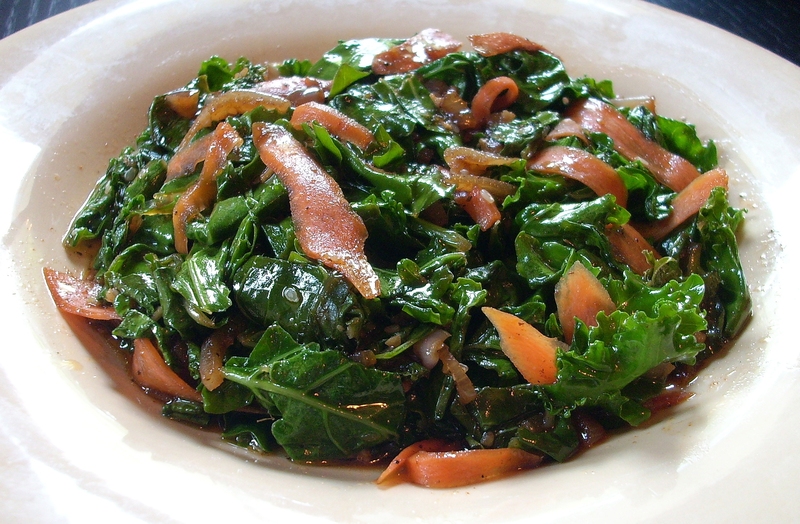 I can eat Collards, Chard, and Kale everyday, if I want to. 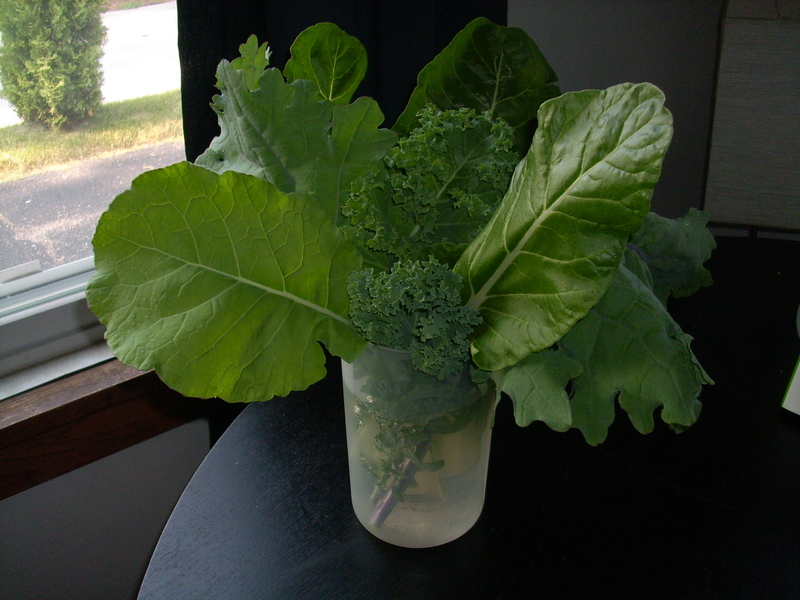 These greens are loaded with nutrients and are a great cleanser, after a long weekend of partying. 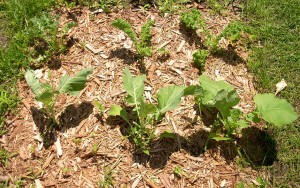 The Kale is the is the most hardy of the bunch and will survive even a hard freeze (24 degrees). Generally, it dies off after the first significant snowfall. I created a wild rice dish with these greens and some northern beans. 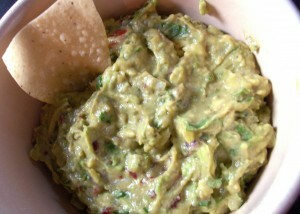 I am still fine tuning the recipe and will post it in the near future. The dish is very earthy and most likely more suitable for a brisk Fall day. These green beans were picked a couple weeks ago. I used some in a pasta dish and with some grilled pouch potatoes. Furthermore, I made a quart of pickled dill beans. The green beans in this picture came from a bush variety. I also planted pole beans about 55 days ago. The pole beans are just beginning to flower, but the Japanese Beetles are starting to feast on the foliage. I have been using minced garlic as a natural way to repel the beetles. Any member of the Allium family (Garlic, Onions, Chives) will help repel these guys. I hope to get a few more beans from my bush varieties before they die off. By that time, my pole beans should be producing. I dug up these new potatoes last weekend. I was curious to see what was happening underground. Initially, I was only going to dig up one plant, but it was too much fun to pull those treasures out of the ground. So, I ended up pulling all four plants from the bed. It yielded around five pounds. I will wait on my other potatoes until Fall when the plants die. At that point, I should get 20-25 potatoes per plant, which will need to be dried for winter storage. I made smashed potatoes and grilled pouch potatoes with some other veggies. They were excellent. The idea was loosely based on this recipe. The new potatoes are sweeter and can actually be eaten raw right after harvest. The sugar content is much higher upon picking and the solanine (Toxin in Potatoes) level is much lower with new potatoes. As time passes, the sugars turn to starch and solanine levels increase, especially when exposed to light. 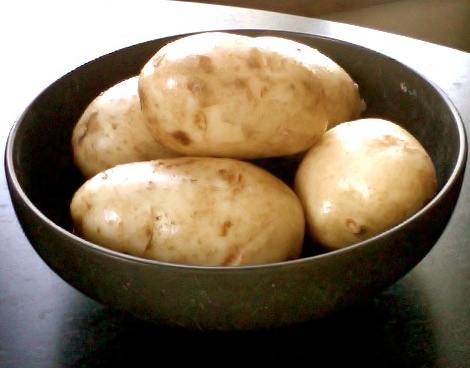 Green potatoes are poisonous and occur when potatoes aren’t stored in a dark place. Don’t ever eat them. Thoroughly cooking storage potatoes will breakdown most of the solanine, rendering them edible. Storage potatoes unlike new potatoes are not to be eaten raw. I chose not to be adventurous and cooked my new potatoes. 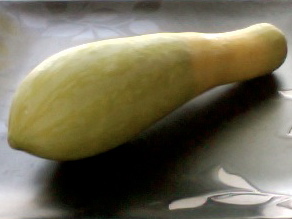 This is the first summer squash from my garden. 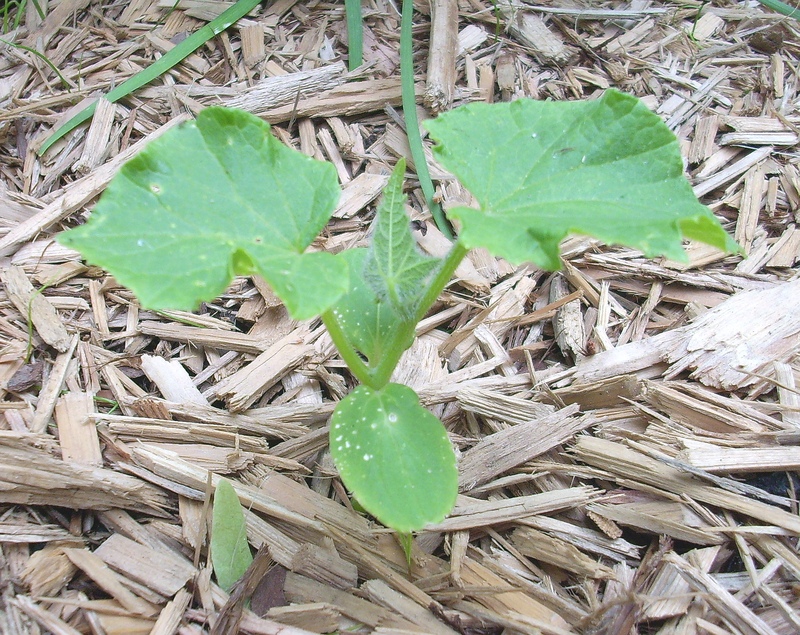 I planted the squash from seed about 45 days ago. 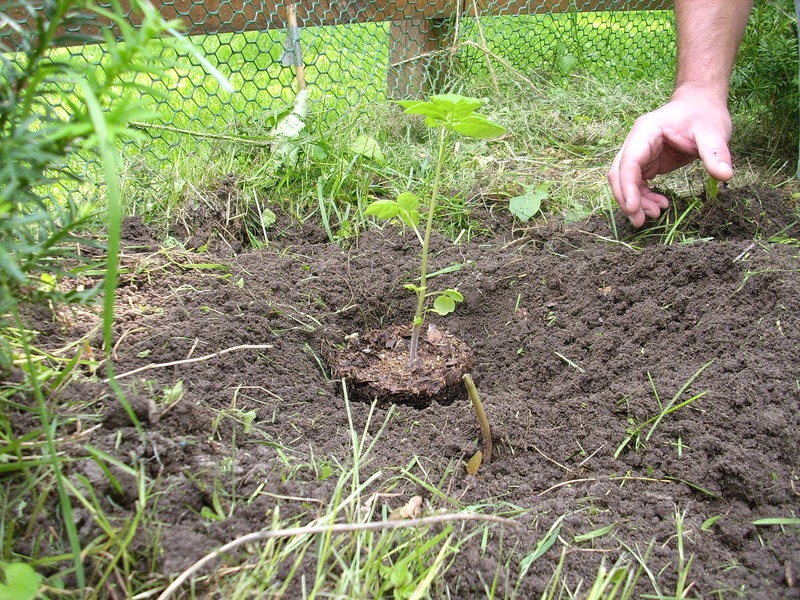 The plants are huge and will be big producers until the first frost. I will have plenty to share, considering my aversion to summer squash. I only like it grilled. 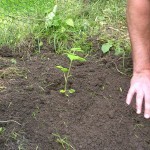 I planted a Patty Pan variety and a Zephyr Squash, as seen in the picture. Even though I am not a huge squash fan, I have heard that the flowers are great in salads and can also be stuffed. So, I will have to try that out. The plants produce large yellow flowers that would impress any dinner guest. 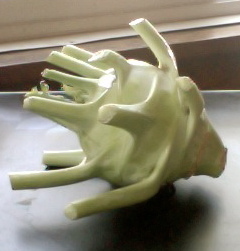 This ugly guy is kohlrabi. 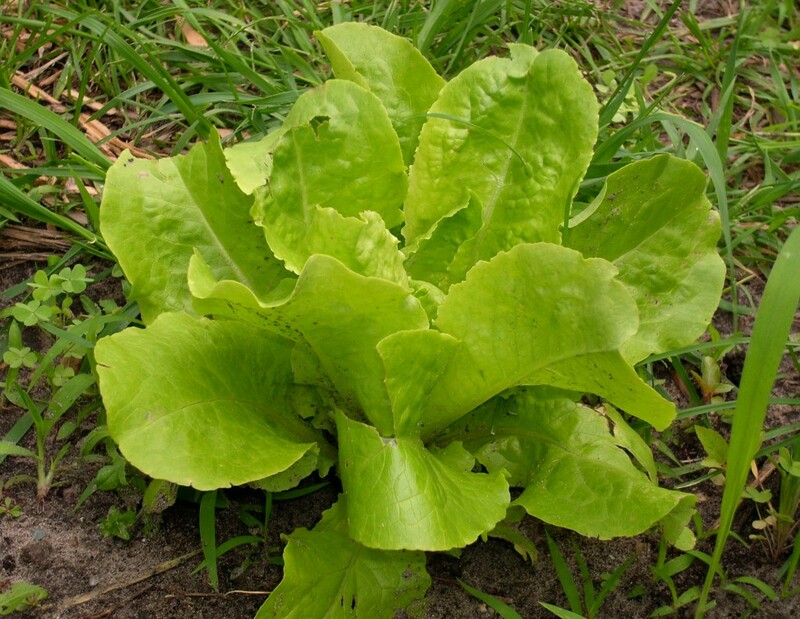 It is a member of the Brassica family and is closely related to cooking greens. The part of the plant you see above is the stem. It needs to be peeled, because the fibrous exterior is impossible to chew up. The inside has a radish like texture, but is more mild in flavor. I eat them with some ranch dip or cut them into cubes and throw them in a salad. Kohlrabi can also be used like a potato and stores well if refrigerated. 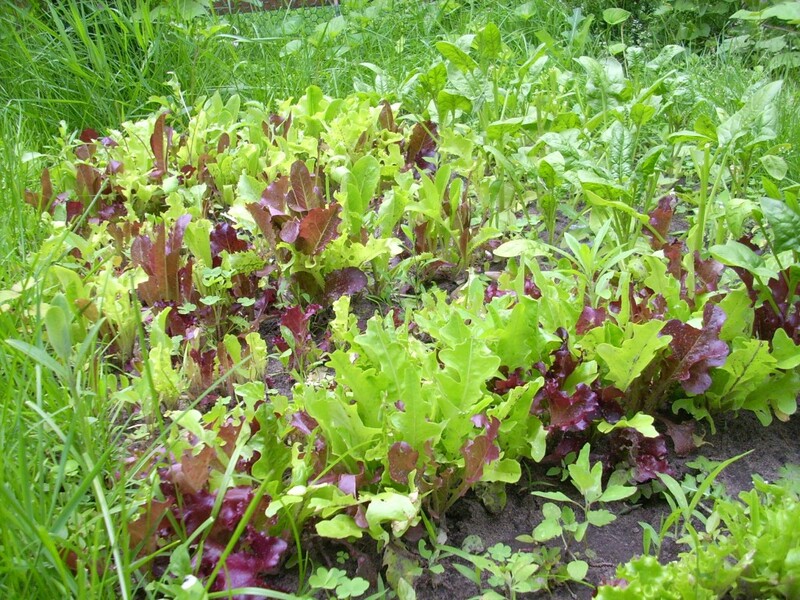 You can also eat the green leaves from the plant, which should be prepared like other cooking greens. 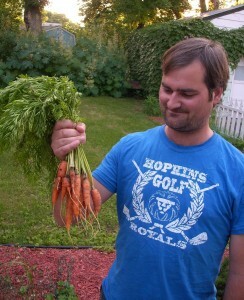 These are the first carrots of the year. They are delicious on salads, but I really want to pickle some of them. I probably have around 3 pounds total from this summer harvest. I will be planting way more in the next week. Those should be ready to harvest in mid to late September. It has been anywhere from 90 to 101 degrees for the last 8 days. This is not ideal for germination, so I will plant my Fall crops once the heat breaks. My tomatoes, peppers, potatoes, and basil are doing great with the heat. Look for a full garden update in the next week. Heat and mosquitoes have made the last week unbearable in the garden. Put 3 tbsp of neutral oil, 1 tbsp of vinegar, and 1 tbsp of soy sauce in a large pan on low heat. Finely chop 4 cloves of garlic and 1 small shallot and add to the pan. Saute ingredients on low heat for 5 minutes. Do not let the garlic burn. Then, roughly chop 10 cups of kale, remove the stems, and add to the pan. Also, speed peel a carrot into ribbons and add to the pan. Add 1 tbsp of toasted sesame oil, 1 tsp of cayenne pepper, and 1 tsp of black pepper. Saute until kale starts to wilt. It should brighten up in color, if it turns brown you have overcooked it. 1. I created a raised bed out of some old cinder blocks that I found in my garage. The bed is 3×6 feet. 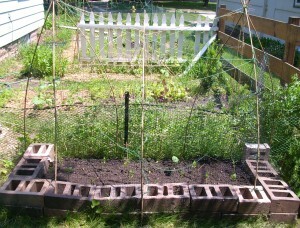 I planted some pole beans and constructed a trellis for them. The beans started to germinate a couple of days ago. We have had weather in the low 90s the last couple of days, so I have been watering heavy. 2. 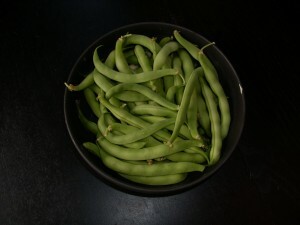 I have been harvesting snow, sugar snap, and shell peas over the last week. They make a delicious snack, especially with some homemade ranch dressing. With the recent heat, I doubt that I will get many more peas. 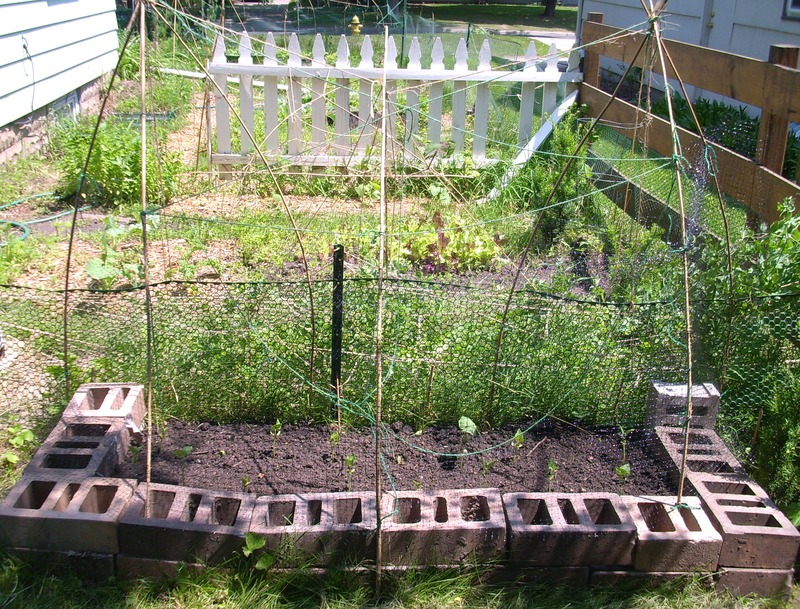 I also tried an experimental trellis system that was a minor fail. Look for a future post about it, with pictures. 3. My spinach and arugula are done. I turned their beds and planted edamame to add some nitrogen to the soil. 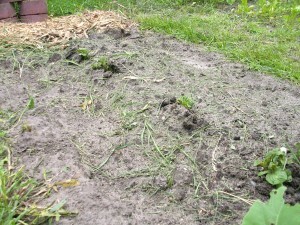 If the soybean harvest is early, I may turn the beds again and plant arugula and spinach again in the fall. My spring mix is still providing great yields, but it doesn’t like this heat. I keep the ground well watered in order to keep the soil temp down. This allows me to get 1 or 2 extra cuttings. 4. The cooking greens are looking great and will give me and my friends a steady supply of kale, chard, and collards through October. Look for a future post with my sesame kale recipe. 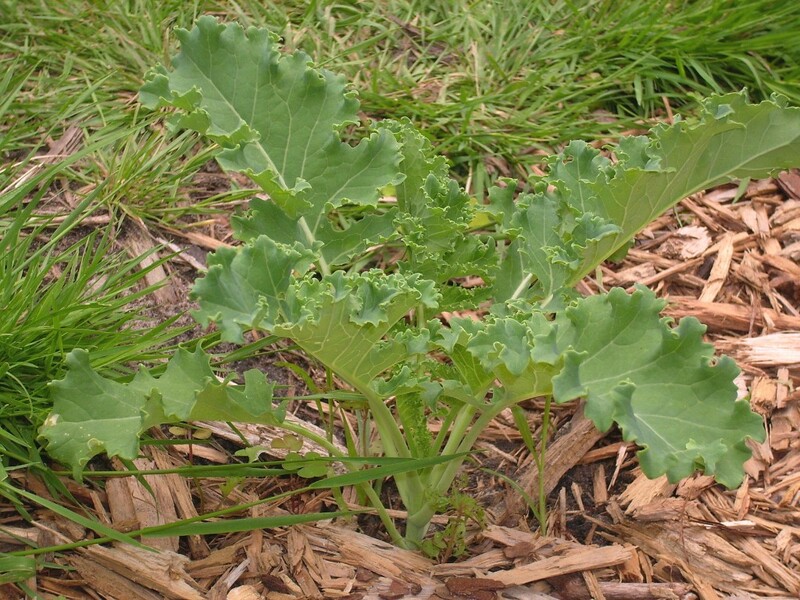 I planted several different varieties of cooking greens, because I had a major pest problem with my lacinato kale last year. Hopefully, that pest is a picky eater and it stays away from the other varieties. 5. The curcubits and nightshades are doing better after a rough week for some of them. I didn’t harden off all of my starts. Therefore, some of the plants got leaf burn from the intense natural light. I trimmed the leaves that were burned, so the plants could spend all their energy on new leaf growth. Overall, I lost one pepper plant, but all of my tomato transplants look healthy enough.. The cucumbers are taking off and I planted two summer squash varieties (Patty Pan and Zucchini) today. 6. I threw a final layer of dirt on top of my potatoes. I did this 3 times. It tricks the potatoes and increases yields. 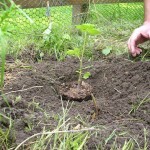 Basically, I let the leaves break through the soil and then I cover them with more dirt. This is the first time that I have grown potatoes, so I am interested to see how well this technique works. 7. 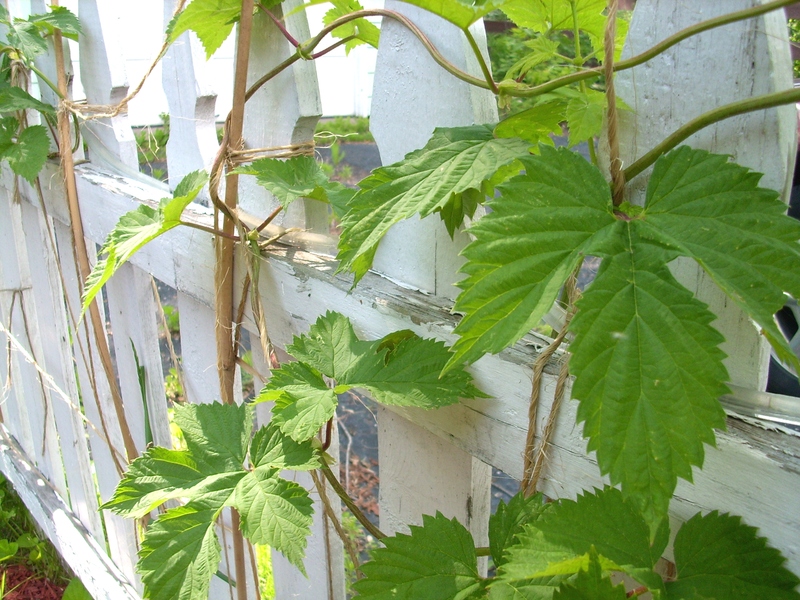 I have hops growing along a fence in my backyard. If supported they will grow to be 20 to 30 feet tall. They smell great and can create a natural privacy fence. Oh, and of course you can brew some bitter ales with them come Fall. Watch for brewing tips from agridude’s resident brew master, Austin Jevne from Driftless Brewing. 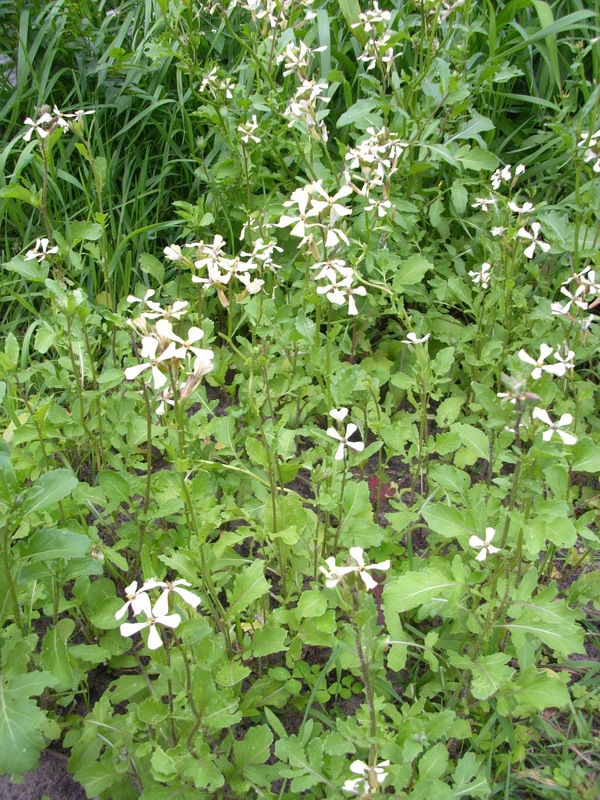 This is some arugula that recently flowered. The leaves will be more bitter now, because the plant is putting its energy into producing flowers. The nutty flavor of this green is nice for spicing up a salad or bowl of pasta. When cooking arugula make sure to add it to the dish late in the cooking process. It is not quite as robust as spinach and can only handle a quick braise. This Blue Dwarf Kale is just about ready for harvest. 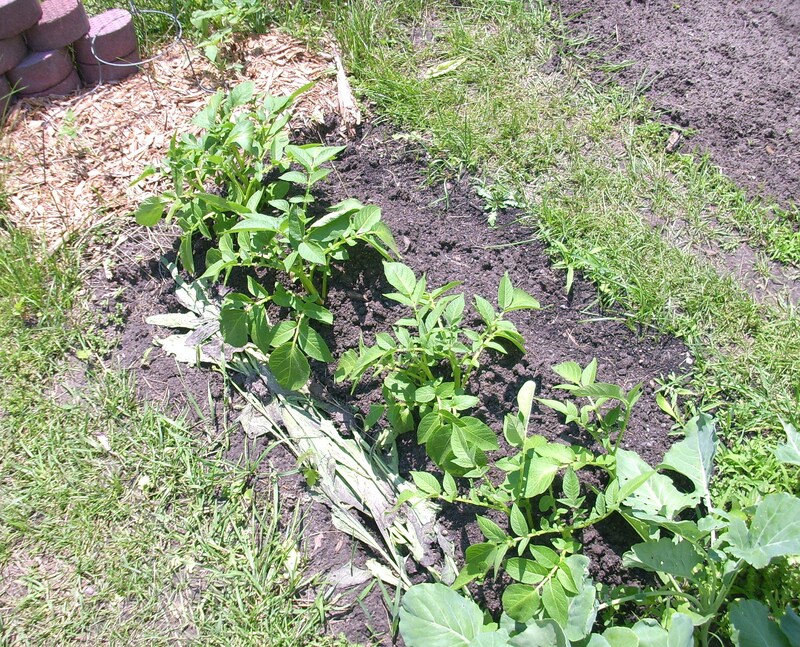 I used mulch around the plant to retain moisture and to reduce the competition from weeds. The mulch is nice to use on beds that you do not plan on turning that same year. If you don’t have mulch, try straw. It is a great alternative and breaks down much faster. I look forward to sauteing the kale in some toasted sesame oil or bacon grease. The spring mix and spinach are dealing with some encroaching grass. I need to do a better job of containing the growth in between my beds. These crops have already been big producers for me this spring. 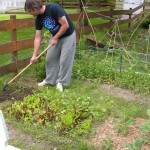 It is one of the better raised beds that I dug. I hope to get another couple weeks of production out of these guys, before the soil gets too warm. The butter leaf lettuce is doing pretty well. I am going to let them get real big before I harvest. The weather is going to stay cool, so there is little risk of them going to seed anytime soon. 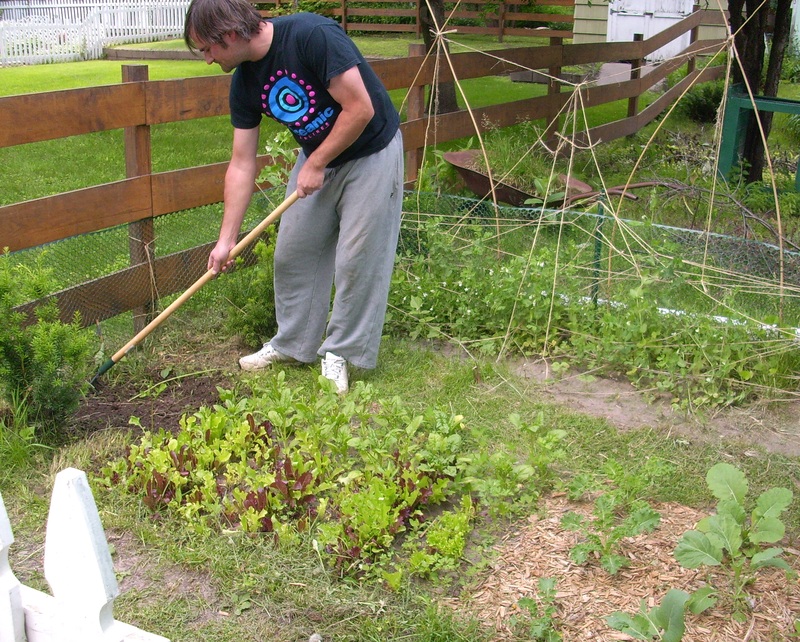 However, once they do start to produce seeds, the plant will be way too bitter for consumption. 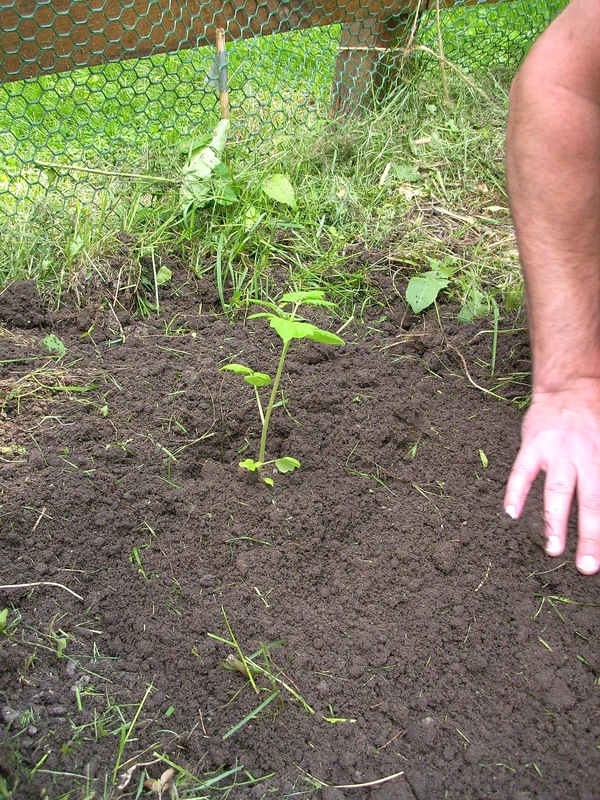 Here is a cuke seedling. As you can see the cotyledons (original 2 leaves) have not dropped. Growth should start picking up in the next couple weeks. I transplanted my toms and peps over the last couple weeks as well. Minnesotans don’t have the benefit of a Mediterranean climate. We have to wait for the soil to warm up into the 70s, before the cucurbits (Cucumbers, Zucchinis, Watermelons) and nightshades (Tomatoes, Peppers) start to show any significant growth. 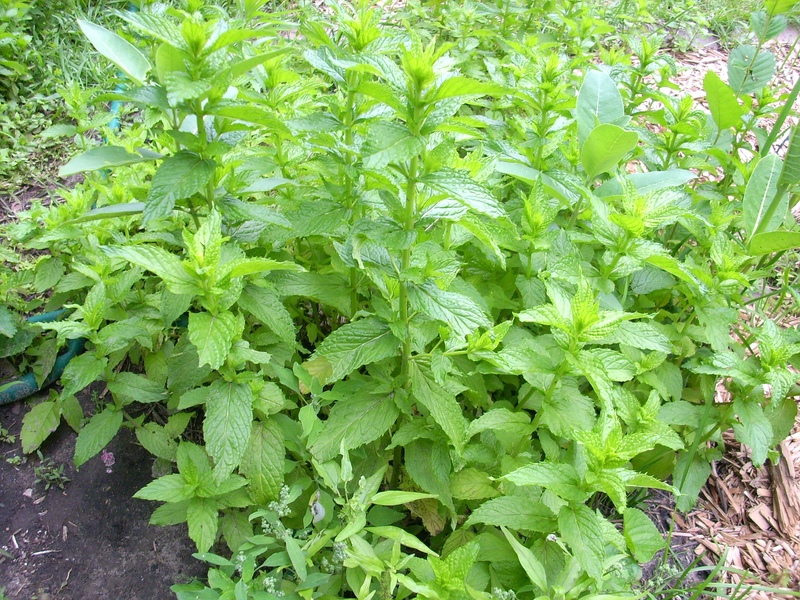 Mint grows like a weed. I had to pull up half the mint in my garden today to make room for tomatoes and cucumbers. This perennial is great, even in northern climates, and helps make a mean mojito. Just grab some rum, sugar in the raw, limes, and club soda, and you will be ready to mash up a tasty summer refreshment. 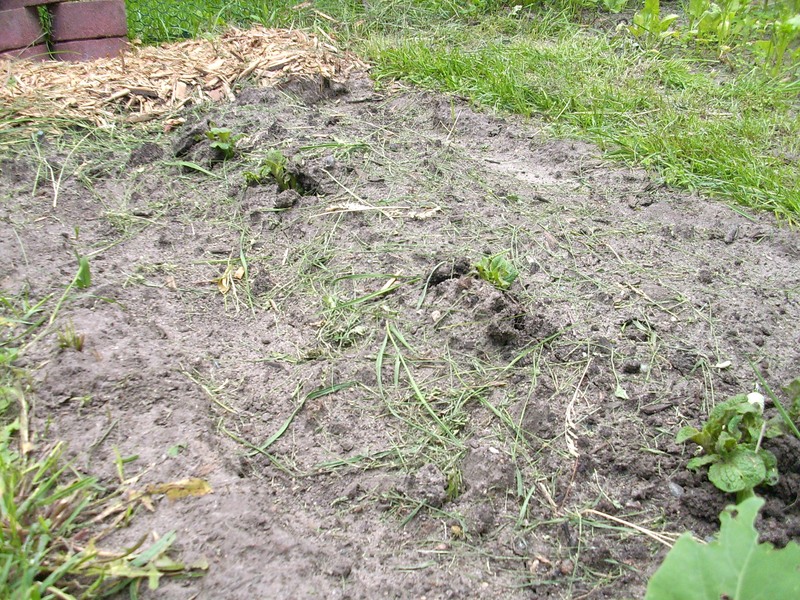 These peas were planted in late March, as soon as the soil thawed. 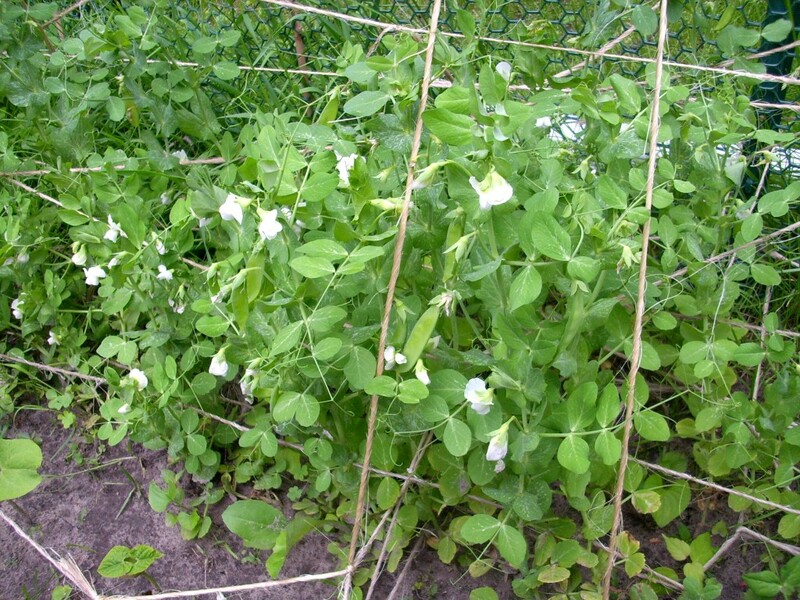 Snow peas take 60 days to reach maturity, which means I have been harvesting away this week. You can plant peas multiple times throughout the season. 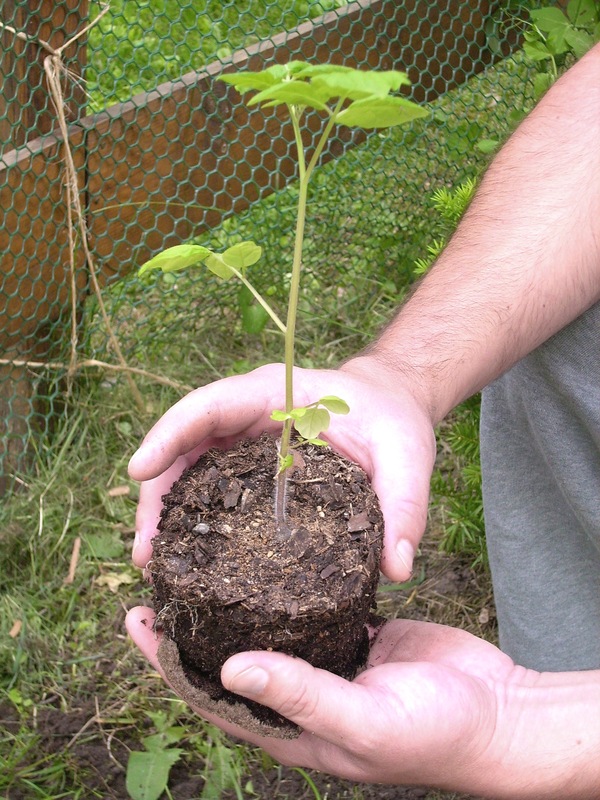 So, stagger your plantings and make sure you start getting some in the ground again in late July, because peas are very cold tolerant and will survive into late October. 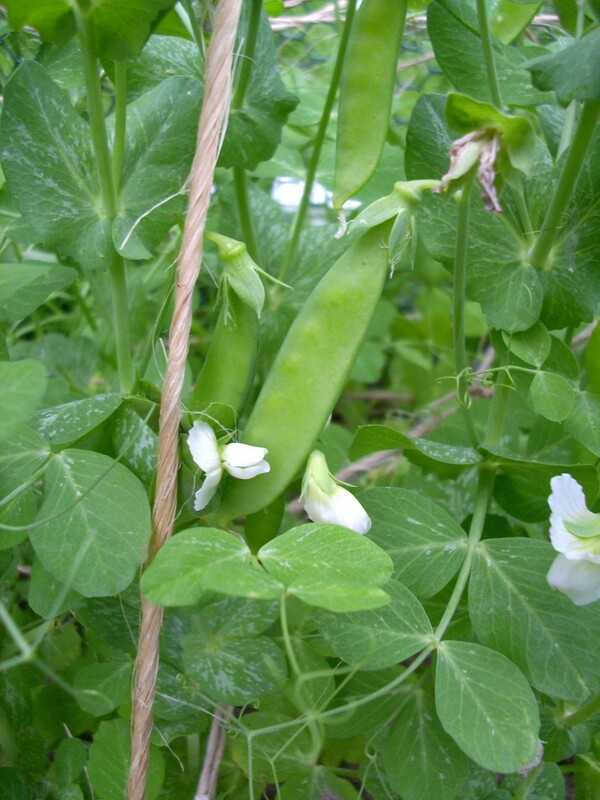 Peas also serve another purpose in the garden besides providing us with a good source of protein. 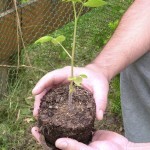 All legumes (Peas and Beans) put nitrogen back into the soil. 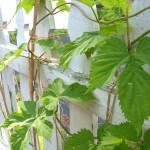 For this reason, it is a good idea to rotate them around your garden from year to year.